At most Chinese weddings, the bride wears a qipao. 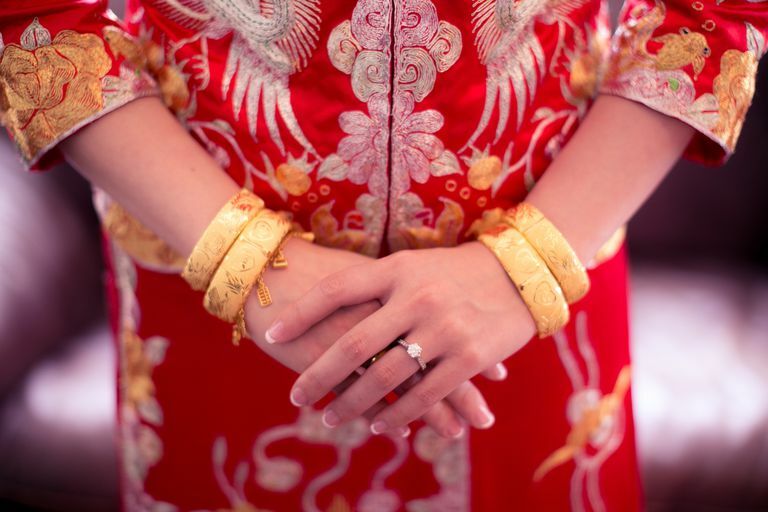 At many Chinese weddings, the bride wears more than one Chinese wedding dress. Most brides opt for three dresses -- one red qipao, one white, Western-style wedding gown, and a third ball gown. The bride will begin the wedding banquet with one dress of these dresses. The groom typically wears one or two suits. While some grooms may opt for a traditional Zhongshan suit or Mao suit, it is more likely to see older guests wearing a Mao suit. Instead, most grooms wear tuxedos or Western-style business suits. What Types of Flowers are Most Popular for Chinese Weddings? A Play About Bridesmaids: "Five Women Wearing the Same Dress"
What Is a Qipao in Chinese Fashion?